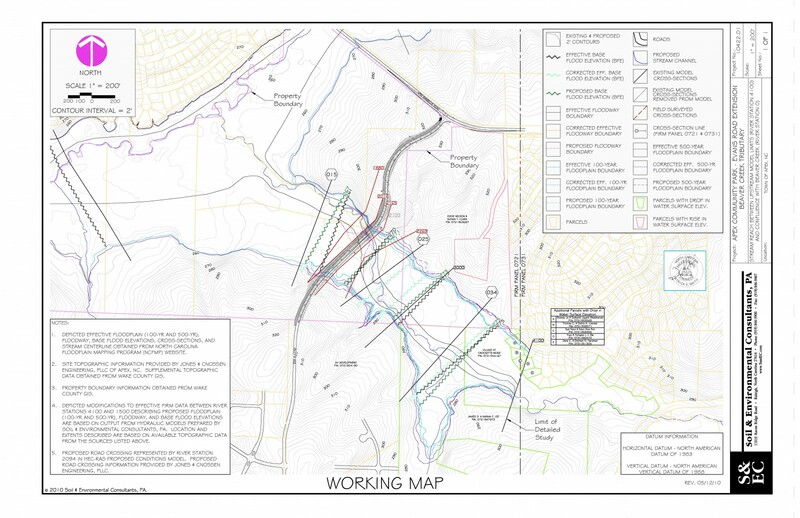 S&EC performed hydraulic analyses for a stream crossing at the proposed Apex Town Park to determine water surface profiles for various design storms for a planned community park service road within the Town of Apex, North Carolina. S&EC’s project scope included the conversion of available hard-copy HEC-2 (Water Surface Profiles) models into U.S. Army Corps of Engineers (USACE) HEC-RAS (River Analysis System) format for use. Subsequent hydraulic modeling utilized HEC-RAS to simulate existing and future developed flow conditions. S&EC prepared recommendations for the design of the proposed crossing for the design engineers. S&EC’s project scope also included the preparation of the hydrologic and hydraulic report for submittal to the Federal Emergency Managment Agency (FEMA) including base flood elevations, water surface profiles, flood mapping revisions, the Conditional Letter of Map Revision (CLOMR) application, and necessary review coordination with FEMA. In addition S&EC performed a jurisdictional delineation of regulated wetlands and streams, and evaluated the proposed crossing in regard to USACE and NCDENR Division of Water Quality and permitting requirements. Following construction S&EC evaluated post-construction conditions and prepared the Letter of Map Revision (LOMR) application with all the necessary supporting information for submittal on behalf of the Town of Apex.